By far my favorite way of getting to Vancouver is by train. There's two trips per day, it only takes about 3 hrs from Everett, the view of the Puget Sound is wonderful and it's comfortable. Usually tickets run about $20 each way. I know you can drive it in about the same amount of time but it's just not the same. Culturally Vancouver isn't THAT much different than Seattle although it seems to be a bit more cosmopolitan. The three things that give Vancouver somewhat of a "foreign air" is the Canadian Currency, the Metric System and the number of people with French accents. However, when we drive to Vancouver it doesn't feel that much different than going to Portland or Spokane because you're isolated from the people around you. When you take the train you rub elbows with the locals, use the Skytrain, Seabus, Aquabus and regular buses to get around. It FEELS like you went somewhere. I highly recommend it. When I stay in Vancouver I like the little quaint hotels and my favorite is the Victorian Hotel on Homer. It's sort of a bed-and-breakfast flavored hotel but you have to book ahead as it's not big and they fill fast. Check booking.com for the best deals (often cheaper than the Victorians own website). They also have ONE family room with three beds which we works well when the whole family is with us. They give you a nice breakfast and the service is good. Something happened when I booked though and I made the reservation for March instead of February and the Victorian was full when we arrived leaving us without a room. The nice lady at the Victorian set us up with a room at the Kingsman Bed and Breakfast. The one rule I've learned when a hotel is full and they reserve you a room somewhere else is that other room won't be as good as the one you wanted. Why? Because they will NEVER book you in a hotel that's a better deal then their own or you wouldn't come back! The other room will either be more expensive or won't be as nice. In the case of the Kingsman it was both more expensive and not as nice. It's called Bed and Breakfast and I suppose if you think a man handing you a bagel in the morning is breakfast than the title is fitting. The beds are in very dark depressing hallways and the there's ONE (count it) bathroom/shower on every floor so get up early if you want to be clean. The ONLY nice thing I can say about the Kingsman is it's across the street from Medina Cafe which has long lines in the morning. From the windows of the Kingsman you can keep an eye on the line so you can get quicker. I've done articles before comparing the Seattle to Portland travel options of driving vs. flying vs. the train. Although my initial impression was that driving would win on cost and flying would win on speed I was wrong. All three methods take the same amount of time from downtown to downtown if being fair (ie. you need to put gas in the car, get through security, wait in line to board the train etc..). The train ended up being cheapest for up to 3 people and by far the most enjoyable. Flying lost every comparison. When you fly you have less usable time, more interruptions (light rail, security gates, boarding, wireless disconnect, de-boarding, light rail) and more discomfort (small seat, TSA) so it lost in every aspect. The Amtrak Cascades won in most aspects outside of freedom once arriving at the destination and frequency. The reason I'm writing about this again is that Hipmunk a travel search engine has added Amtrak to it's search results. What's also interesting about Hipmunk is that it includes an Agony filter. You can sort by least Agonizing trip. I'm not sure what criteria Hipmunk uses but I'll show the results for Seattle to Portland trips. Also keep an eye on the prices for a round trip ticket. The trip with the least agony is also the cheapest. Only if you have extra time before your next flight.. I've always wanted to just mess with the TSA since they're completely asinine half the time but I'm always in a hurry it seems. This tote bag would be good fuel for the fire though. I'm sure they wouldn't think it's very funny and would insist on going through all of my bags just to express their opinion but I think I might try it anyway.. Even funnier (and more disruptive to my travel plans) would be to tape on tin foil shaped scissors etc... I'm not sure what they'd look like in the X-ray machine but it might be fun to find out. TSA isn't that careful anyway so they might not notice. 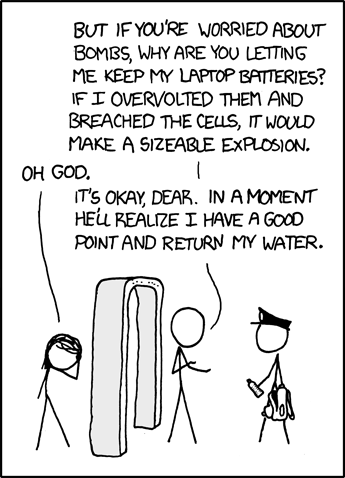 I did an article quite some time ago about a third party company testing airport security. On average they were able to get fake bomb parts through security 25% of the time. That means that every four terrorists through security could blow up a plane. There was a time where we had bottles of liquid in our bag and they pulled us aside and hand searched the bag. Once they found two they threw them away and sent us on our way. When we got to the hotel we opened our bag and took out the rest. Another time they swore they saw sissors in a friends bag so they took everything out until there was nothing left and still said they saw scissors but since they couldn't find them they let us through anyway. What if they saw a gun but couldn't find it, would they let us through? If you fly Southwest Air you can for a limited time sign up and get 4 credits. For those who don't know 16 credits gets you a free flight so getting 4 free is the same as getting 25% of a flight. I know it's not much but it will get you closer to a free flight on Southwest 25% faster than if you don't sign up. I figure I have miles with 12 airlines now in "loyalty" programs so I might as well add another. Besides if other promotions come out I may be able to work closer to a free flight without even spending a dime.